Practice principal Gary Dorman has been at the practice since 1991 and since taking over the running of the practice in 1998 has constantly been improving and updating all aspects of the practice to provide the highest quality Dentistry. Gary Dorman BDentSc (GDC Registration Number 65701) Gary has also been successfully providing the In-Line Clear Removable Brace System to treat crowded and misaligned teeth in adults for several years, having been so impressed after he treated himself with the system! He also gives talks to dentists interested in using the system in General Dentistry. It has proved to be both a quicker and more cost effective form of treatment to alternative clear brace systems. Our associate dentists all come with several years experience in General Dentistry but also have their own special interests. Johanna Lloyd DDS, PG Dip Endo (GDC Registration Number 101040) Johanna graduated in Dentistry in 2004 from the Georg-August-University, Göttingen, Germany. Since then, she has developed a wealth of experience in private dental practices in London and Germany. In 2011, Johanna was awarded a post graduate diploma with merit in Endodontics at the Queen Mary University of London. Johanna enjoys all areas of general dentistry, but has a particular interest and skill set in cosmetic and aesthetic dentistry. She has completed several advanced post graduate courses in this area and is qualified to provide orthodontic treatment using Invisalign and Inline clear brace systems. Johanna is known to provide a relaxed and pain free patient experience whilst delivering the highest level of care. Caroline Askew BDentSc, MFDS (IRE) (GDC Registration Number 82609) Caroline has particular interests in all aspects of Oral Surgery. She has membership of the Royal College of Surgeons and has extensive surgical experience working as a Speciality Doctor in Oral Surgery at Canterbury Hospital. She also carries out Implant Treatment and Wisdom Tooth Extractions at the practice. Both Caroline and Johanna are also trained in providing Botox treatments for facial cosmetics, which is also very successful in treating excessive underarm sweating. This is becoming an increasingly popular form of treatment for this common condition in both men and women. Please ask your dentist if you might be interested in these treatments. Heidi Ells BDS (GDC Registration Number 79243) Heidi was awarded a Bachelor of Dental Surgery with merit from the University of Glasgow in 2001. Since then, she has worked in variety of NHS and private general practices. Heidi has a particular interest in cosmetic and aesthetic dentistry and has completed several advanced post graduate courses in this area. Heidi also has a wealth of experience providing orthodontic treatment using the “Inman Aligner” brace system. Heidi prides herself on her ability to provide the highest level of care to her patients whilst delivering an experience that is as relaxing and pain free as possible. Jan Jeyarajah BSc BDS MFDS RCS Ed (GDC Registration Number 83158) Jan has a great wealth of experience, having worked in both hospital, and private and NHS practice environments. Jan enjoys all aspects of general dentistry, but her particular interests are in aesthetic dentistry, as well as orthodontic treatment, using the 'Inman Aligner' brace system. She is conscientious with her work - creating and maintaining healthy, confident smiles. Jan has membership of the Royal College of Surgeons and is currently nearing the completion of the Diploma in Implant Dentistry at the Royal College. 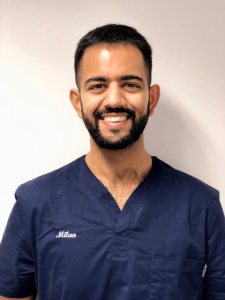 Milan Majithia BDS (Bris) MJDF RCS (Eng) PgCert Dent Ed (GDC Registration Number 243995) Milan is our newest dentist to the practice having qualified from Bristol University, trained under senior consultants at Kings College Hospital before working in prestigious private practices around London. His main interests are managing nervous patients who are terrified of the dentist and will be providing sedation once he has completed his course as well as minimally invasive dentistry. To further enhance his skills he was most recently trained by Harley Street experts in providing facial aesthetics. Outside of dentistry he is an avid quiz master having been on the weakest link and winning £5000 on a show called Perfection! Stephanie Freeman Diploma in Dental Hygiene and Therapy (GDC Registration Number 126361) Stephanie graduated as Dental Hygienist and Therapist from Kings College in 2010. She has worked in a number of private dental clinics in her 14 years within the dental profession, as well as running an oral surgery assessment clinic routinely taking radiographs. She has a particular passion in educating patients in the importance of dental health and the prevention of periodontal disease and dental decay. She works hard to provide a comfortable experience for all including the extremely nervous. Her time is divided between a number of practices, with previous experience working at an implant clinic in central London. Trudy Parker EDH (GDC Registration Number 5046) Trudy has been a hygienist at the practice since qualifying at Kings College Hospital London in 1996 and spreads her week between here and another private practice. Always cheerful and enthusiastic she assists patients to improve their oral health from gum disease to tooth decay and prides herself on giving thorough treatment whilst making the experience as pleasant as possible with great results. Together with our team of fully qualified nurses and receptionists we are now able to provide almost all forms of Dentistry at the practice without having to refer out for treatment. All of our staff undergo Continuing Professional Development through regular courses.